Effective January 1, 2017, employees in Michigan will see a minimum wage increase from $8.50 to $8.90. This increase marks the third step of a gradual 25 percent increase in the minimum hourly wage rate and will culminate in a $9.25 per hour rate in 2018. Public Act 138 the Workforce Opportunity Wage Act (WOWA) of 2014 took effect on May 27, 2014, replacing the Michigan Minimum Wage and Overtime Act (Act 154). WOWA is enforced by the Wage and Hour Division – an agency within the Bureau of Employment Relations. The law applies to Michigan employers with two or more employees, age 16 and older. A copy of WOWA and related resources including the required poster may be obtained by visiting the Wage and Hour Division website. The current minimum hourly wage is $8.50. The rate will increase to $8.90 per hour on January 1, 2017, and to $9.25 per hour on January 1, 2018. Act 138 allows an employer to pay a newly hired employee, ages 16 to 19, the hourly rate of $4.25 for the first 90 days of employment. 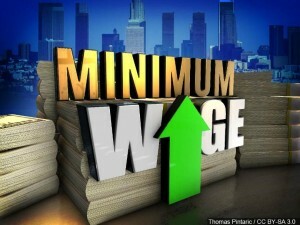 WOWA also allows an employer in Michigan to pay 85 percent of the minimum hourly wage rate to employees aged 16 and 17. Employers covered by both state and federal minimum wage law must pay the higher of the two rates. • The employee is in a position which customarily and regularly receives gratuities from a guest, patron or customer for services rendered to that guest, patron, or customer. • If the gratuities plus the minimum hourly wage rate do not equal or exceed the minimum hourly wage otherwise established, the employer pays any shortfall to the employee. • The gratuities are proven gratuities as indicated by the employee’s declaration for Federal Insurance Contribution Act. • The employee was informed by the employer of the provisions of Act 138. • If a credit is taken for gratuities received by an employee, then the employment records for each pay period shall contain the credit that was taken along with a written statement of the amount of gratuities received by the employee. The statement shall be signed by the employee and dated before the date the paycheck was received. Employees covered by the overtime provisions of WOWA must be paid one and a half times their regular rate of pay for hours worked exceeding 40 hours in a work week. For further questions or information, contact us today!